LEN - www.lankaenews.com | Gnanassara guilty of all 4 charges ! Sentenced to 18 years RI – lesson to other monks too who disgrace the robe ! (Lanka e News – 08.Aug.2018, 10.25PM) The robed rowdy rascally monk Galagodaathe Gnanassara who was indicted on four charges including committing contempt of court was found guilty of all four charges by the appeal court today (08) , and sentenced to 18 years rigorous imprisonment . He was delivered a sentence of four years in respect of each of two charges –that is 8 years in jail for two charges , and a sentence of five years in respect of each of the two other charges –that is ten years in jail for the two other charges . The appeal court declared the sentences can run concurrently , and completed in six years. 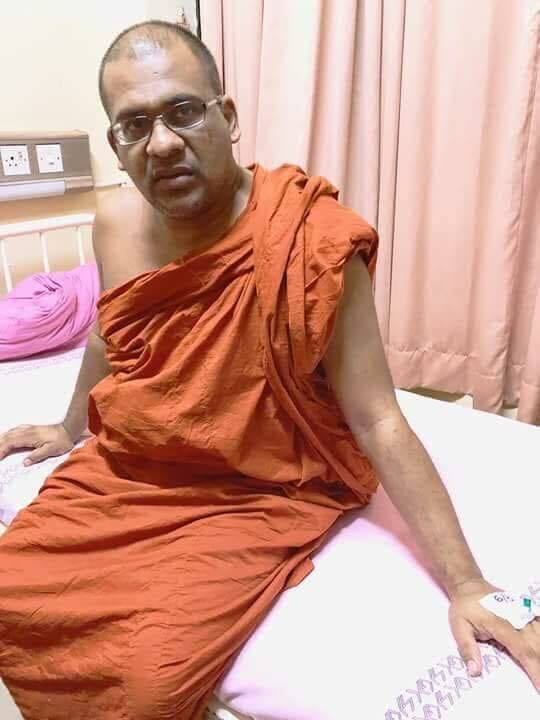 Gnanassara who is always up to tricks and mischief despite wearing the sacred saffron robe even on this occasion evaded courts by hospitalizing himself. However the court ordered the prison officers to immediately arrest him and put him in prison. The judgment was delivered by judges , the appeal court president Preethi Padman Surasena and Shiran Gunaratne . It is well to recall Gnanassara the monk has all along disgraced the sacred robe and pristine Buddhism on an unprecedented scale . His conduct was so evil and abominable that he is dubbed ‘the monk from the junk’ . Earlier on he was fined by the courts for driving a vehicle under the influence of liquor. On another occasion he scolded and insulted a lawyer within court by addressing him ‘dog’ . On that occasion he was warned and discharged by courts . In another instance this hooligan monk was sentenced for intimidating and insulting Sandya Ekneliyagoda , a lady within courts. The robed rowdy Gnanassara was engaged in processing cinnamon before he became a monk .Despite wearing the sacred saffron robe he was the very antithesis of a true monk following true Lord Buddha’s teachings. He once pleaded guilty before court when he was charged because of his dipsomaniac habits. He also shamelessly demonstrated he is a monk from the junk who has a mistress in France, and a child by her from his illicit affair. So needless to say , Gnanassara is a good for nothing devil incarnate who is wearing the sacred yellow robe to shamelessly live on the free food supplied by the people who are toiling and sweating to eke out a living .. This sentence is a good warning to the other rascally monks too from the junk eating free food , bloating their bellies and who trail behind Gnanassara . Full details of the court verdict shall be revealed in a subsequent report.